Stop the press! Introducing a new non-iron twill shirt that helps you keep your sharp looks long past 5 o'clock. Crafted from special 40-singles compacted yarn which enhances the fabric's softness and comfort. 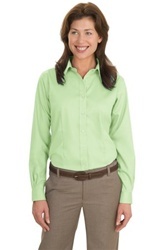 This new shirt is a practical and stylish addition to your professional wardrobe.